Back in February, at MWC 2018, Qualcomm announced that it would introduce a new family of processors, the Snapdragon 700 series. 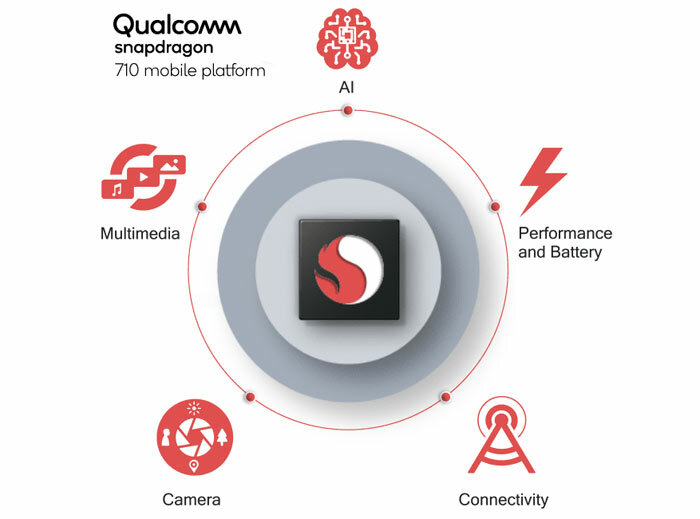 Fast forward to today and the first of the new range has been announced, the Qualcomm Snapdragon 710 Mobile Platform. As we mentioned in the article published during MWC, the new range is destined to be a 'Goldilocks' solution in both features and performance terms. One more thing of note is that this is Qualcomm's first 10nm processor outside of the 800 Series. As evidenced more and more in smartphone promotion and advertising, AI is seen as an attractive enhancement to the latest models. Such processing capability enhances the smartphone personal assistant functionality, voice functionality, photo processing, classification and sorting, and other features. In the new Snapdragon 710, Qualcomm says a multi-core AI Engine delivers "up to 2X overall performance improvements in AI applications, as compared to the Snapdragon 660". Furthermore, the AI engine works in a heterogeneous model with the Qualcomm Hexagon DSP, Qualcomm Adreno Visual Processing subsystem and Qualcomm Kryo CPU. On the topic of performance the new Snapdragon 710 represents a significant leap in both CPU and GPU operations. The new Kryo 360 CPU architecture, built on ARM Cortex technology, is optimized to support up to a 20 per cent overall uplift in performance, 25 per cent faster web browsing and 15 per cent faster app launch times, compared to the Snapdragon 660. An enhanced GPU, the Adreno 616, can deliver a 40 per cent reduction in power consumption for both gaming and 4K HDR video playback, as well as a 20 per cent reduction in power consumption when streaming video, when compared to Snapdragon 660. Qualcomm's Snapdragon 710 Mobile Platform is available immediately to its customers - mobile and smart device makers. We would expect the first such devices to begin to appear in H2 this year.